Most people enjoy having a quality cell phone, but they also recognize that cellular phones are a consumable good and will have to be replaced within in a few years. For this reason, people often do not purchase the most expensive cell phone when they purchase their mobile. Some, though, must have a costly mobile phone. 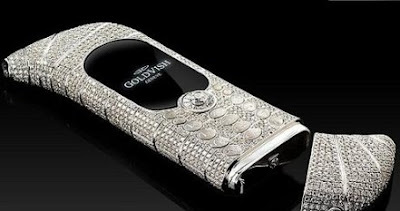 The world’s most expensive cell phones were made to satisfy just that type of person. The Chairman by Ulysse Nardin is the world’s most expensive Android smartphone, and includes both a touch screen and a physical number pad. The Ulysse Nardin name is most often associated with luxury watches and that fact shows in the Chairman’s sophisticated design. The volume controls look like watch buttons and the crown between them can actually be wound to generate power for the device. In fact, the phone features a kinetic rotor power system visible through the backplate. 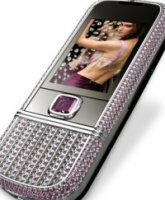 Designed by Peter Aloisson, this solid 18k white gold phone features over 680 pink and white brilliant cut diamonds totaling over 21.5 carats. Some of the phone’s features are a 3.15 MP camera with autofocus and video, a music player, Bluetooth and voice memo. The Princess Plus got its name from the Princess cut used on 138 of the 318 diamonds on its surface. The other 180 diamonds on the phone were brilliant-cut. 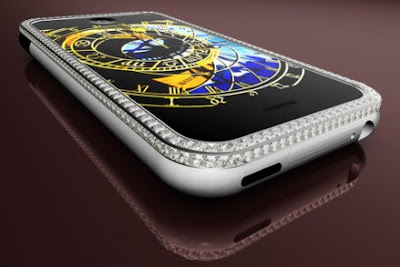 In total, the phone has 17.75 carats of diamonds set in 18k white gold around its rim. The iPhone Princess Plus is worth $176,400 while the somewhat more pedestrian “Brilliants only” version sold for $66,150. The price of this phone comes from actual state of the art technology instead of a bunch of shiny rocks—but that doesn’t mean it lacks visual appeal. OLED technology underneath the polycarbonate skin that covers the phones entire face gives the 4 megapixel screen a borderless look. The mirror finish gives the phone a sleek, futuristic look. This gaudy phone is so exclusive that only eight will ever be made. Designed by French jeweler Boucheron, the Signature Cobra is made with two diamonds, two emeralds and 439 rubies. For buyers who are only filthy rich, rather than obscenely rich, twenty-six of the less flashy (read: no rubies) Signature Python phones will be available for a mere $115,000. Both phones will feature the real draw—they have frikkin’ snakes on them. Awesome. This ultra-exclusive phone, limited to only three units, truly lives up to its name. Not only is it extraordinarily expensive, but its Egypt-inspired design will look right at home in the hands of a Vegas high-roller. 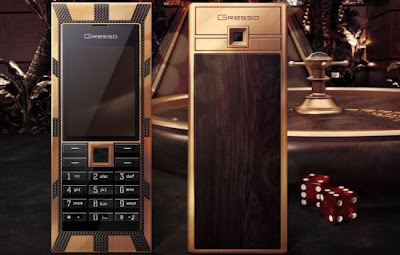 The phone features 45.5 carats of black diamonds decorating the bezel and a back panel made from 200-year-old African blackwood—the most expensive wood in the world. As if that weren’t enough to ensure the Jackpot a place among the world’s most expensive mobile phones, each key is cut from a hand-polished sapphire crystal. All of these luxurious materials are set in a 180-gram solid gold frame. 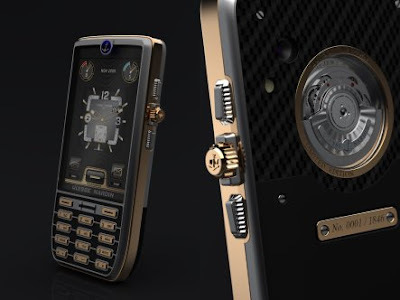 Created by luxury accessory producer Peter Aloisson of Moscow-based JSC Ancort, this luxury smartphone’s price stems from the platinum body, the cover adorned with 50 diamonds—including eight that are rare blue diamonds. Additionally, the Ancort logo and the navigation key are made of 18k rose gold. Built on the Windows CE, this expensive cell also features a high-resolution color TFT display and a 256 bit cryptographic algorithm. 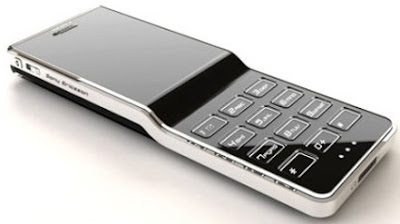 This expensive mobile phone features SMS, MMS, E-mail and Internet capability, WAP, JAVA support and even a media player. Guinness World Records certified GoldVish SA’s ‘Le Million’ Piece Unique on January 29th, 2008. The Geneva-based luxury communications company’s expensive mobile phone was designed by Emmanuel Gueit as an addition to the Illusion Collection. 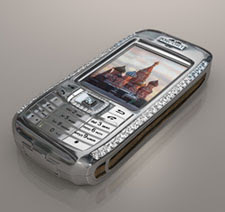 The phone is made of 18k white gold and set with 20 carats of VVS1 (only microscopically flawed) diamonds. The phone also features Bluetooth, 2 GB of storage, FM radio, a digital camera and MP3 playback. This expensive cell phone is available only by special order. The Kings Button iPhone is, surprisingly, a jewel-bedecked iPhone. This time, however, Aloisson had the iPhone 3G to play with—and, apparently, a bit of a bigger budget. One hundred and thirty-eight brilliant-cut diamonds line the sides of the phone, but the real prize is the home button—a rare 6.6 carat white diamond. Stuart Hughes of Goldstriker International is known for giving luxury devices such as phones and video game consoles the “Supreme” treatment—covering them with gold and diamonds—and the iPhone is no exception. 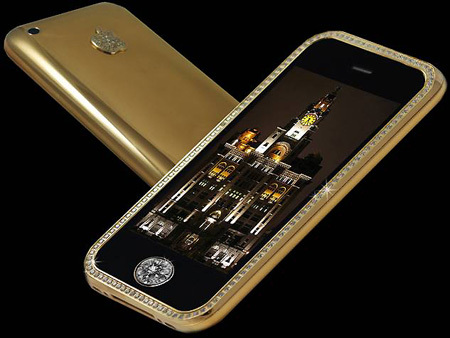 The iPhone 3GS Supreme features a casing made from 271 grams of solid 22k gold and a screen trimmed with fifty-three 1-carat diamonds. The home button is covered with a single rare 7.1-carat diamond. That’s not all, though—the iPhone 3GS Supreme comes in a chest carved from a single block of granite and sports Kashmir gold and an interior lining made with Nubuck top grain leather. If you thought his iPhone 3GS Supreme was impressive, check out the latest iPhone from Stuart Hughes–the iPhone 4 Diamond Rose Edition. Hughes has recreated the infamous antenna band that wraps around the sides of the latest iPhone, as well as the backplate, using rose gold. The band is adorned with 100 carats of flawless diamonds, and the Apple logo is formed with fifty-three more diamonds. Once again, the home button gets the most love–it’s made of platinum and features a rare 7.4-carat pink diamond. 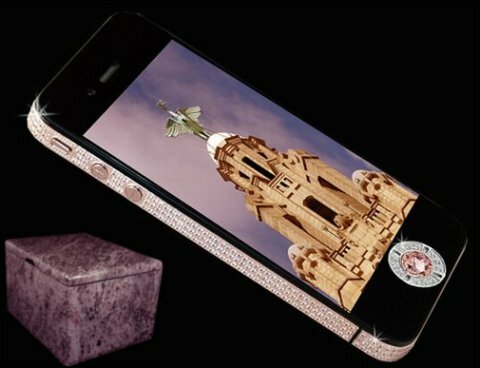 The phone comes in an imperial pink 7-kilogram chest cut from a single block of granite and lined with nubuck top-grain leather. It also comes with an 8-carat flawless diamond that can be used in place of the pink one.